Picture Book Monday with a review of What do you do with a problem? Learning how to deal with problems is a vital skill to have. The funny thing is that many of us have no clue what to do when things go wrong. We wring our hands, have a panic attack, moan and groan, or burst into tears. We try to run away from our problems, or pretend that they are not there. Needless to say, none of these strategies improve our situation in the slightest. Today's picture book will help readers of all ages to better understand how to deal with a problem. The narrative is beautifully presented without being preachy or pedantic. The story is supportive and it helps readers to think about their problems in a new way. One day a little boy finds out that he is saddled with a problem, a problem that he does not like, did not ask for, and does not want. He has no idea what he is supposed to do with the problem or what it wants, and not surprisingly he would like it to go away. He tries shooing it, scowling at it, and even ignoring it but nothing works. The thing about problems is that they can cause a lot of new problems. People worry about them, and get anxious that their problem will do something to them or change their life in some dreadful way. The worry builds on itself and unfortunately this only makes the problem bigger. No matter what the little boy does his problem can always find him, and the more he tries to avoid it “the more I saw it everywhere.” The problem is taking over his life! No matter how old you are problems can get the better of you. They worry at you and make you so miserable that you start to feel as if your life is just one big, uncontrollable problem. Thankfully the author and the illustrator of this remarkable book understand exactly what this feels like, and they offer readers support that is simple and yet profound. It turns out that problems contain something special and surprising. For most of us humans, the process of getting our food is relatively simple. We go to a shop or a market and buy what we need. For animals, this process is more complicated. Food has to look for , which can take hours or days. If the animal eats meat, a prey animal needs to be caught and killed. In this poetry title children will find unique poems that explore what animals eat. The sometimes 'ick' worthy poems combine humor and facts to give children an entertaining and educational experience. Animals spend a lot of their time looking for food. After all, if they don’t forage or hunt for their meals they will “croak,” and therefore “finding food / is no joke.” Some of the things animals eat might not seem at all palatable to us, but to them they are vital, and no doubt delicious as well. In this book young readers will see how animals of different species are connected through their need to eat. One of things that we humans forget sometimes is that all animals are part of a food chain. Perhaps we forget because we are at the top of our chain most of the time. In the poem Food Chain, we see how a butterfly gets eaten by a lizard, which gets eaten by a garter snake, which then gets eaten by a roadrunner. Every animal has a place in a chain, and every food item that they eat has its place as well. We may think that animals that eat dead things are disgusting, but in fact their dining choices serve a very useful purpose for the rest of us. The vulture for example, who is “No dainty vegetarian,” loves carrion, and this is a good thing too because if they didn’t disease-ridden dead bodies would be lying all over the place. Nighthawks and little brown bats both love to eat insects, and they have different strategies to catch their preferred dinners. Both animals hunt at night or in the early evening and they catch their meals on the wing, swooping, and in the case of the bat scooping, the insects out of the air. Some animals have come up with quite complicated strategies to get their food. When it is hungry the wood turtle goes around “Stompin’ its feet / and slammin’ its shell.” All the commotion causes worms to “pop up / to see who’s jamming,’” which is when the turtle eats the worms. Children who have a fondness for things that some would consider unsavory are going to love this book. The interesting thing is that a great deal of information is wrapped up in these poems. For readers who would like to know more about the animals mentioned in the book, the author provides notes at the back of the book that are packed with more facts. Not long ago I had a day when everything seemed to go wrong. The hose attacked my ankles and I fell over. The dishwasher dumped water all over my feet. A stack of books fell over onto my toes, which hurt a lot. On and on it went until I began to seriously consider climbing into bed and staying there for the rest of the day. At least in bed I would be safe! Today's picture book is about a charming little badger character who has a bad day, a day full of little calamities. One morning Badger wakes up and he decides that today he will only do “things I enjoy doing.” It is going to be his special day. As soon as he gets out of bed he knocks over his bedside lamp, but thankfully it does not break. In the best of moods Badger sits down to have his breakfast, which is when he knocks over his cup and it falls to the floor and shatters. Badger is very upset because the cup was his favorite one. Badger then decides that he wants to draw a picture, but he can’t find his colored pencils anywhere. He cannot help feeling rather upset that his day, which was going to be “such a treat” is going so wrong. Perhaps he will be better off in his yard where he always has fun. While Badger is playing outside he trips and knocks over the wheelbarrow, cutting his knee in the process. Dear me! Badger needs to do something to turn his rotten day into one that is not so full of accidents, and so he heads off to find his friends. Maybe if he leaves home his day will improve. It turns out that Badger is not the only one having a bad day. 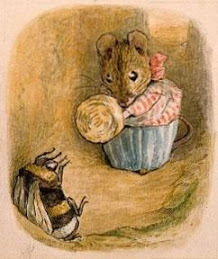 Raccoon’s clothesline has broken, Stag has lost his ball, Squirrel has a scratch, Rabbit’s fishing line is tangled, Fox’s front door is blocked, and Mouse cannot figure out how to bake a cake. The bad day seems to be touching everyone in the forest. Everyone has bad days sometimes, days when nothing seems to go right and when one wishes one could go back to bed. In this charming picture book we meet a badger who is having just such a day and who does his best to turn a bad day into a good one. Children who are having (or have had) a bad day of their own will really appreciate why the animals in the story are so upset. I used to consider the idea of a novel written in verse rather intimidating. How could such a thing work? Wouldn't it be hard to read? Then, some years ago I read a wonderful mid-grade novel in verse and I became a staunch fan of this storytelling form. In fact, much gleeful rubbing of hands takes place when a new novel in verse arrives at my house. Today's poetry title is a novel in verse that moved me so much that I felt compelled to read it twice in one day. There is so much to be found in the words, and so much to consider as one comes to understand what Garvey's life has been like. Many children are put off when they see a book that is full of words. They want pictures to look at, not words! After all, how can words possibly take the place of pictures. In today's picture book we meet a young duck who has this reaction when he finds a book that has no artwork in it. As the story unfolds, the duck discovers something rather remarkable about words, something that opens up a whole new world to him. One day a duckling finds a book and, full of expectation, he picks it up. When he opens the book he discovers that the book has no pictures in it, only words. What is the point of a book that has no pictures in it! The duckling then gives the book a hefty kick, but he does not stay angry for long. After all, it’s not the book’s fault that it is picture-less. Feeling a little bad about his behavior, the duckling picks the book up and apologizes for his outburst. In this marvelous picture book a little duckling discovers that a book that does not have pictures is actually quite a miraculous thing. Words take more work to figure out than pictures, but in the end the work is worth it. Children are going to love the way this narrative ends, and they may even begin to think about what it is going to be like for them when they can read books, word-filled books, for themselves. The opening ceremony for the 2016 Olympic Games takes place today in Rio, and so I thought it would be fitting to bring you a book that celebrates the games. In this title, nonfiction, poetry, and artwork are combined to show readers why the Olympic Games came into being and what it is like to participate in them. On August 6th, 1945 an atomic bomb was dropped on the city of Hiroshima, Japan. Thousands of people died that day, and many thousands died in the months and years that followed from their injuries, radiation sickness, and cancer. One of these people was a little girl called Sadako. Her story is now famous, and it has touched the hearts of people all over the world. Today I have her story in picture book form, and it is presented in a way that makes this true story accessible to children. This tale is based on the true story of a real little girl. Sadako Sasaki was living in Hiroshima, Japan, when an atomic bomb was dropped on that city on August 6, 1945. As a result of the radiation, Sadako, like so many other people who lived in Hiroshima, developed leukemia. She heard about the legend of the paper cranes and began to make as many of the origami creations as she could. By telling the story from the point of view of a cat, the author and illustrator of this beautiful, moving tale adds a layer of intimacy to what is already a powerful story. At the back of the book she tells us a little about the real Sadako and her legacy.